Zaya Kolia isn’t waiting to finish his degree before getting started on his acting career. The School of Acting BFA senior from Academy of Art recently ended a nine-day run in The North Pool in San Francisco, in which he played one of the leads in the two-character play. Kolia played Khadim, a Middle Eastern high school student who gets called into the office of the vice principal, Dr. Danielson, portrayed by Bruce Avery. As their afternoon goes on, secrets unravel, racial tensions rise, and emotional stakes mount. With only two characters in the production, Kolia admitted the role was a heavy responsibility. “It’s all about us and our connection,” he says. 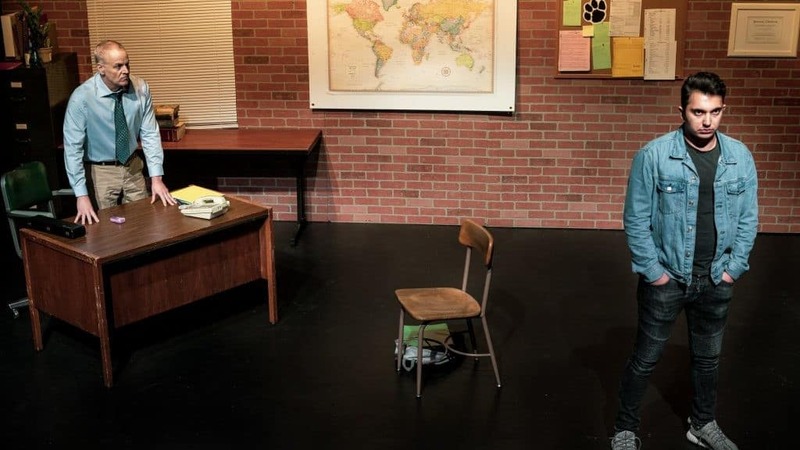 The play, a taut drama written by Pulitzer Prize finalist Rajiv Joseph and directed by Lana Palmer, is set in a single location—the aforementioned office—and plays out in real time. It’s a production of Bread & Butter Theatre, a local company that stages contemporary drama and Shakespeare in the Bay Area. Kolia recalls the speed with which the company worked. “We had three or four rehearsals, and then we opened the show,” he says, noting that during those scant rehearsals, he was in another show at Berkeley Playhouse, a holiday production of The Wizard of Oz. During that period, he was onstage either performing or rehearsing every day of the week. Kolia has played a number of parts in past Academy productions, including Six Degrees of Separation, Cloud 9 and, most recently, The Drowsy Chaperone. Landing a role outside of school and having family and friends attend The North Pool was, according to Kolia, “unreal.” He says that while backstage on opening night, he could hear the energy of everybody in the audience, and that once he and his castmate came out, “it was just effortless. We fed off the audience’s energy, and our own energy was fun…all his jokes were landing and all my jokes were landing. Kolia says that while it was great to have an audience of friends, fellow Academy students and people from the Bay Area theater community he’s met through the years, he was focused on making his family happy and proud. “I do this for my family. They wanted me to…get a degree in law. My cousin’s a lawyer. Another cousin’s a neurosurgeon. Another is a luxury home real estate agent. Now in his final semester, Kolia credits the Acting School’s undergraduate program with preparing him as a professional actor. “[Early on], I wanted…results. I wanted to be in the lead,” he admits. “But I learned that it’s all a process. Kolia graduates in spring 2019, but not before appearing again on the Academy stage, this time in the university production of the Tony Award-winning musical In the Heights by Lin-Manuel Miranda. Post-graduation, Kolia will appear in a local production of Passions by Stephen Sondheim at the Custom Made Theatre Company in San Francisco.